This is the most obvious, who are you sending the email to? The email cannot be sent if not addressed to at least one recipient. The Cc: text field can include additional recipients separated by commas. All those in the list can 'read' who these 'carbon copies' are sent to. The BCC: text field can also include additional recipients. No one else receiving the email from the To: or Cc: list can 'read' these recipients. BCC: stands for Blind carbon copy. The subject of your email should briefly describe the content of the email to follow. 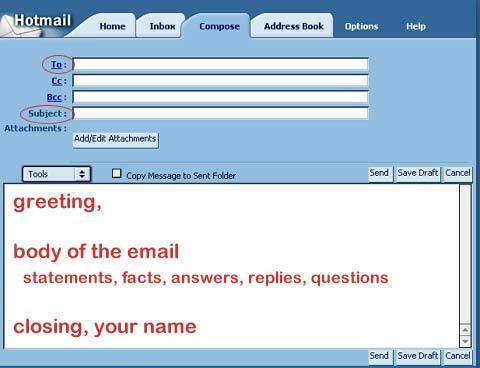 It should be descriptive to give the recipient a clear idea of the email (s)he is opening during their busy day. Leaving this blank leaves your email incomplete and inconsequential in someone else's inbox full of more important emails. Don't leave your recipient clueless. Include an opening greeting, as you would in a short letter to someone you know. Get to the point of the email and communicate your message effectively. Make yourself understood with concise statements. If you are asking a question or requesting information, be sure you have supplied enough information so their reply will be well-informed. Sign off with an appropriate closing and your full name, if appropriate. Before you press the Send button..
Read your message for clarity. Put yourself in the place of the recipient and read with their eyes. Spell check. This is a simple process that will clean up mistakes you may have made in haste or are unable to see. Save or send a copy to yourself if you need it as a reference or archive of your brilliant writing. Examples of good emails I have received this past week. Names removed for privacy. The Subject tells me what to expect before I open it. The message gives me 3 pieces of pertinent information in 2 easy to read sentences. The subject is a bit cryptic in a list of many emails, however the message references the exact language of the assignment. Very clear and informative. The Subject reveals who this email is coming from because the address is as yet unfamiliar to me. Very courteous. This email reinterates the information (email address) in the body of the message to be sure I receive it intact. Examples of not-so-great emails I have received this past week. Names removed as a favor. The subject of this email has nothing to do with the assignment and is in danger of being filtered into my bulk mail along with the rest of the spam I receive. and oyu told us to e-mail so.... i'am i have tehno on weds i believe... i know i dont have it 2day... well.. i had no problems with the comupter but if i do.. ill email u! All capitals gives the impression of someone shouting. Hard to read as all the letter forms are the same. Message is misspelled and unsure in its statements. HI I'M [student name] AND I THINK I'M IN THE WEDNESDAY CLASS ,I THIINK. AND WELL I GTESS I'M LOOKING FORWARD TO YOTR CLASS. All lower case gives the impression of someone mumbling. This is acceptable for friendly quick notes between friends, but inappropriate for important emails. hi am [student name]. I don't know wether i am in yur clss or not, buti i' here.